The Sandero could build on Logan success in Morocco. PARIS -- Renault's Romanian subsidiary Dacia will launch a locally built version of the Sandero hatchback in Morocco on June 18. The Sandero will be produced from complete knockdown kits at Renault's SOMACA joint venture factory with PSA/Peugeot-Citroen in Casablanca. Renault has manufactured its Logan sedan at the Casablanca factory since July 2005. Sandero hatchbacks made in Morocco will contain 40 percent local content, with the remainder imported from Dacia's Romanian manufacturing and logistics center. The localization rate is identical to that of the Logan, which shares a large percentage of components with the Sandero. Both cars are produced on Renault's low-cost B0 platform. 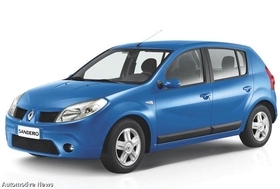 Renault has invested 16 million euros to prepare the Moroccan facility for Sandero production. Investments allowed for creation of a Sandero-specific body shop, increased capacity in the existing paint shop and modernization of a rolling road test-bed at the end of the assembly line. Renault hopes the Sandero will follow in the Logan's footsteps. The Logan has been Morocco's top-selling car since 2006, lifting Renault's Dacia brand into second place in the country's new-car market, which reached 121,360 cars in 2008. Dacia sold 14,958 cars in Morocco last year, including just over 14,500 Logans, good for a 12.3 percent share of the Moroccan passenger car market. Renault sold 19,295 cars in Morocco during 2008, good for a 15.9 percent market share. Morocco is the third country worldwide to manufacture Sanderos, following Dacia's principal site in Pitesti, Romania, and a factory operated by Renault's Japanese alliance partner Nissan in South Africa. Renault's Russian subsidiary AvtoFramos will begin producing Sanderos in 2010. Cars based on the Logan platform are built in eight countries worldwide: Romania, Russia, Morocco, Colombia, Iran, India, Brazil and South Africa. Renault is building a second factory in the Moroccan city of Tangiers that will produce Logan-based cars for global export, mainly to Europe. The French carmaker plans to launch production in Tangiers during 2010, with initial capacity of about 200,000 units. The factory will have installed capacity for 400,000 units, and will also produce cars for Nissan. The Japanese carmaker froze its participation in the joint venture project earlier this year, due to financial constraints linked to the global slowdown.